As much as the next girl or perhaps even more, I love designer shoes! Having bought my first pair of Aruna Seth’s recently for my wedding, I am pretty obsessed with these beauties. It seems I am not alone as we are regularly asked to make birthday cakes with sugar shoes on top for lucky lady recipients. The most popular are Christian Louboutin which I absolutely love and more recently Jimmy Choos. 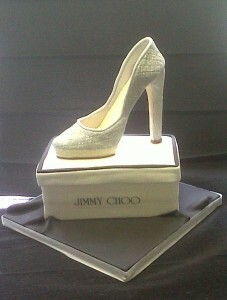 Whilst I would love love love to receive the shoes, I would be equally enamoured with their edible sugar cousins. They are so realistic I sometimes struggle to contain my desire to slip my foot into someones sugar shoe! I think they look amazing and hope you do too. 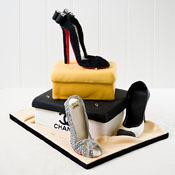 We can make pretty much any designer shoe birthday cake and have a handbags and shoe cakes gallery on our site where you can see a range of shoe cake photos! So just give us a call.